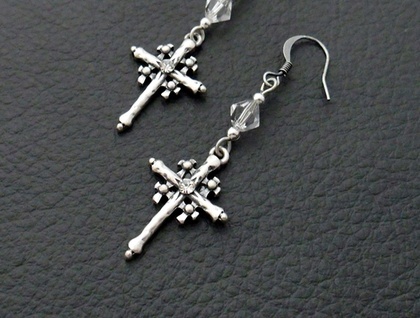 These earrings feature unusual cross charms that have an organic look to them, almost as though they were made out of wood. 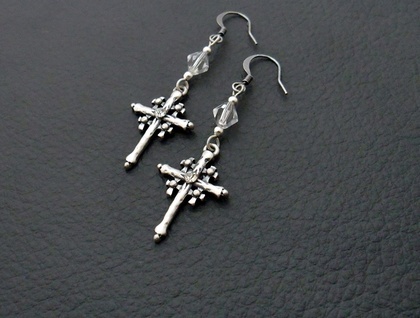 Above each cross is a semi hand-cut crystal bead, its minutely irregular facets adding to the natural look of the earrings. Each crystal bead is flanked by two tiny, shiny, silver-coloured beads. 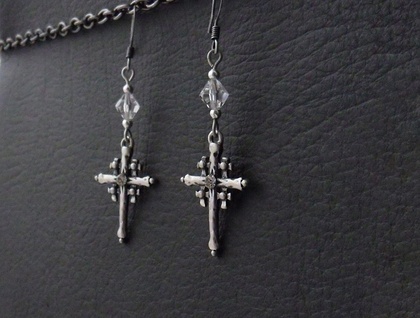 The cross charms have a somewhat medieval look to them, and are antiqued-silver in colour, which gives them an aged appearance. In each of the four forks between the arms is another tiny cross with a ball in its centre, and in the centre of the major cross is a sparkling clear rhinestone. 'Silverwood Crosses' is a one-off design, never to be repeated. The earrings are lightweight and easy to wear, and measure 58mm from top to bottom. From the bottom of the ear hooks, the drops measure 43mm, while the cross charms are 26mm long, including the baile (hanging loop), and 18mm wide. 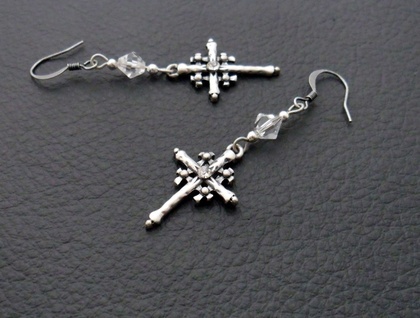 The ear hooks are brass based and silver plated, then antiqued to give them an aged look that matches the crosses.